Rochester Optical's popular line of field tailboard view cameras were made from 1883 through 1902. During this period, a wide variety of models were made, each model having a number of variations. 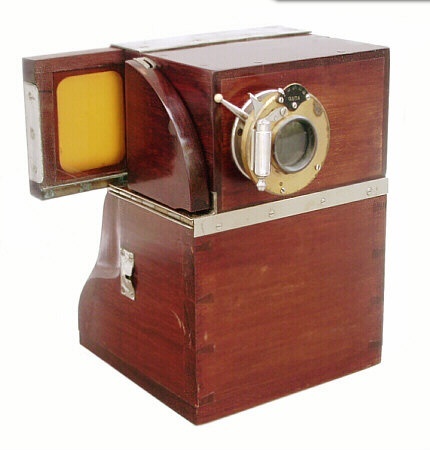 Similar tailboard style view cameras were also made by American Optical and Scovill. The Commodore was made from 1885 to 1894 (see Commodore Advertisement). 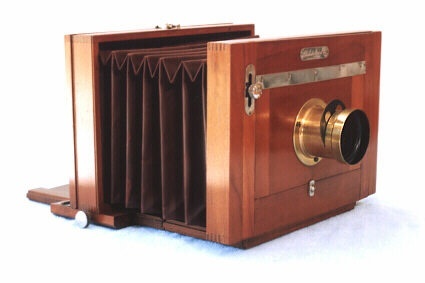 This particular camera is serial number 56 and similar to the New Model View but with a maroon cloth bellows and solid wood bed. It also represents a less expensive "no swing" model. Unlike other Rochester Optical tailboard cameras, this camera has the rear standard directly attached to the focusing blocks and hand-finished wood holding the ground glass in place. This camera was identified in March 1999 as a Commodore based on images found in the 1886 C.H. Codman catalogue. 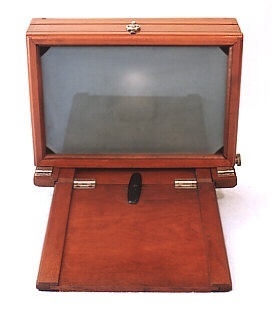 American view cameras with solid beds were made for brief periods and are scarce. While a folding solid bed may have been less expensive and easier to construct, they tended to weigh more than later versions with framed beds. The solid bed on this example is locked in place by rotating an oval piece of wood 90 degrees. The screw that anchors the lock is hollow with inner threads allowing it to also serve as the tripod mount. This camera sold for $18 in 1886 ($341 in year 2000 dollars).